Three star hotel located at the downtown of Donghae! 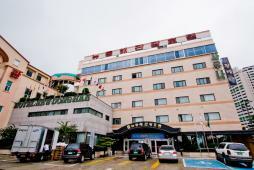 New Donghae Tourist Hotel opened its doors in November of 1990 right at the heart of downtown Donghae, close to beaches, ports, and other nature tourist attractions. Conveniently 10 minutes removed from Donghae Express Bus Terminal and Train Station, it enjoys easy access to numerous attractions including Mangsang and Chuam beach, Murung Valley, Cheongok Natural Cave, as well as to many tasty cuisines. A sauna with natural underground water pumped from 250 meters below is available. The business center is fully equipped with a copying and fax machine, computer, printer, cell-phone charger, and more. Iron, ironing board, and detergent are also appointed in the laundry room. Such service offers make the the hotel ideal for long-term guests and business travelers.